In recent years the Grand Theatre’s holiday offerings have shared a very high level of quality. This year’s offering continues that trend. A Christmas Story is a stage adaptation of the 1983 movie of the same name written by Jean Shepherd of stories published by Shepherd in the collection In God We Trust: All Others Pay Cash from 1966. As one of the few people in North America, it seems, who has not seen the movie or read the book, I could judge Grecian’s adaptation only as a play. I can affirm that the adaption works so well on stage that a person would not ever know that it was adapted from other media. The Grand Theatre has assembled a fine cast and under Susan Ferley’s sensitive direction and A Christmas Story will make an excellent non-musical family show to see during the holiday season. The play is set in 1938 in Hohman, Indiana, Shepherd’s fictional name for his own home town of Hammond, Indiana. 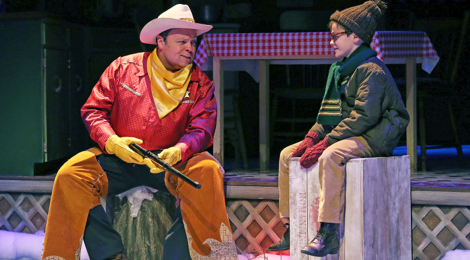 The focus of the story is nine-year-old Ralphie Parker (Callum Thompson), but the play is narrated the grown-up Ralphie named Ralph (Steve Ross), much as Jean Shepherd (1921-99) narrated semi-autobiographical stories about his own childhood in the radio broadcasts that made him famous. Ralph introduces us to the daily routine of the Parker family. Mr. Parker, known only as The Old Man (Matthew Olver), spends his time trying to win contests, escaping the ferocious dogs next door and doing battle with an ancient furnace the family is too poor to have repaired, much less replaced. Mrs. Parker (Sarah Machin Gale) tolerates her family’s eccentricities and holds things together, even though she can only afford to make meat loaf and red cabbage for dinner every night. Ralphie’s younger brother Randy (Isaak Bailey) is well on the way to peculiarity by spending his time hiding in various spots around the house. He also has to go “wee-wee” at many inopportune moments. At school Ralphie’s best friends are Flick (Hunter Burgess) and Schwartz (Josh Buchwald) and the school bully is Scut Farkas (Logan Thompson), who usually beats up Flick but also branches out to Flick’s friends. The smartest girl in class is Helen (Angelina FosterdelMundo) and her friend Esther Jane (Devony House), has a budding affection for Ralphie, who, being a regular nine-year-old boy, completely fails to notice. Episodes involve all these characters, but the overarching plot that holds the play together is Ralphie’s overpowering desire for one specific present for Christmas – a “Red Ryder carbine-action, two hundred shot Range Model air rifle with a compass in the stock and this thing [a sundial] which tells time”. Ralphie gets this idea when he sees an advertisement in a Red Ryder comic book. The story follows Ralphie’s campaign to leave his parents massive hints that this is the one thing he wants most of all. He has to engineer such a campaign because whenever he brings up the BB gun directly, his notion is shot down by everybody, including a department store Santa, with the same remark, “You'll shoot your eye out”. The adult Ralph sets up the action with wit and warmth and the affectionate irony of someone who can now see how the serious concerns of the past can sometimes look a bit foolish in the present. It’s no wonder that Jean Shepherd’s portrayal of growing up in a small town in the American Midwest is seen as a precursor to Garrison Keillor’s tales from Lake Woebegone. Steve Ross, who was so wonderful in the title role in Shrek last year, returns to play Ralph this year. We are so used to seeing Ross play secondary characters at the Stratford Festival that it’s great to see him in major roles at the Grand. Ross really is perfect as Ralph. He has a rich, soothing, well-modulated voice that can bring out the humour of the narrator just through a slight pause or change in tone. Ross imbues Ralph’s narration with a deep feeling for a time now past, before television and computers invaded our homes, when people had to communicate with each other directly. Matthew Olver and Sarah Machin Gale are well cast as Ralphie’s parents. Olver makes The Old Man a gentle, old-fashioned guy with a slightly goofy side, whose pent-up frustration at his restrictive life during the Great Depression he vents in tirades of (made-up) expletives in struggling with the furnace. As Mrs. Parker, Gale shows us a wife and mother who has frustrations of her own but, like the narrator, is able to look on most them with a sense of humour. The one exception is the sensuous leg-shaped lamp that The Old Man wins in a contest that Mrs. Parker can’t stand. Ferley has choreographed a hilarious wordless battle over the lamp with Mrs. Parker turning it off as often as The Old Man turns it on. One of the show’s main delights is the excellent group of child actors the Grand has assembled. All seven of them given amazingly assured performances. Just to highlight three, Callum Thompson is a natural as Ralphie, even though he is given a bad case of rhotacism that causes him to call his gun a “Wed Wydo”. I don’t know whether it is in movie or not. On stage it’s more important that Thompson’s character is always easy to understand. Hunter Burgess is very funny as Flick, the boy who suffers the most physical indignities in the show, including getting his tongue stuck to an icy pole. And Devony House has just the right mixture of drive and shyness to portray the budding of unrequited nine-year-old love. The one adult actor one must mention is Rachel Jones, who does a fine portrayal of Miss Shields, the old-fashioned compassionate, by-the-rules schoolteacher some of us will still remember. She also is great at depicting Ralphie’s exaggerated views of Miss Shields as the Wicked Witch of the West or in ecstasy over his theme about his BB gun. Bill Layton has created a cleverly constructed set showing the Parkers’ kitchen and living room with steps leading to a cutaway of Ralphie’s bedroom upstairs. The set is decorated with a keen eye for period detail as are the costumes he has designed. He lets his imagination go for the various fantasy scenes that depict Ralphie’s imagined need for having a BB gun to defend his friends and family. The best of these is probably the leafy jungle that the kid explorers have to traverse. Susan Ferley has directed the piece with lively but unhurried pacing that allows the show’s humour shine and helps cut through the show’s bent toward nostalgia. Adults will love the show that portrays a less complicated time uncluttered by technological innovation. It’s less clear what young children will get out of the show since the time depicted is so unlike the one they or their parents are living in. Land-lines, radio dramas and even chalkboards with the alphabet in cursive above it are things they may never have experienced. Children should, however, appreciate Ralphie’s conquest of the school bully and identify with his uncontainable desire for one special Christmas present. All in all, it is a well-conceived show that will conjure up warm memories in older adults of Christmases gone by. 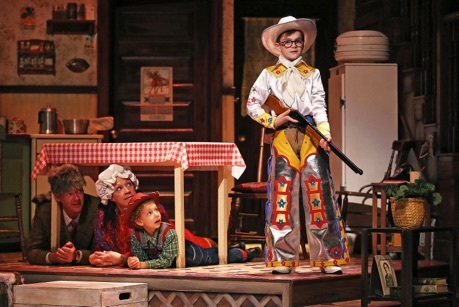 Photos: (from top) Steve Ross as Red Ryder and Callum Thompson as Ralphie; Matthew Olver as The Old Man, Sarah Machin Gale as Mrs. Parker, Isaak Bailey as Randy and Callum Thompson as Ralphie. ©2015 Claus Andersen.